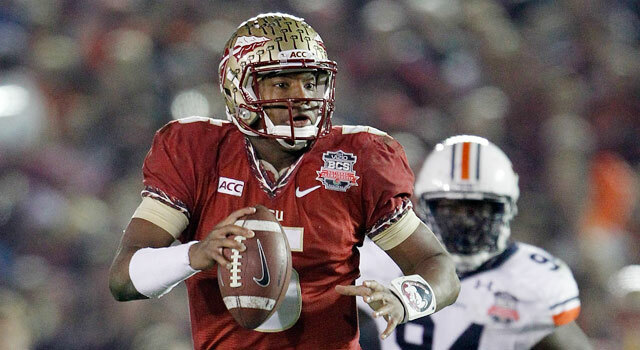 Jameis Winston is looking to lead Florida State back to the national championship game. The BCS is gone, the four-team playoff is in -- and there are more bowls than ever. It's true: Four bowls have been added to the menu this season, so when you include the two playoff semifinal games that will be played in bowls, there are 38 bowls. That means 76 teams will be in the postseason -- or 59 percent of the 128 teams in the FBS ranks. When perusing these bowl projections, remember that a bowl's tie-in with a league doesn't necessarily mean it will get the third- or fourth-, etc., place team from the league; instead, it means it gets the third or fourth, etc., selection from that league. You'll also notice that there is no clear-cut designation for some of the league tie-ins; that's because the leagues and bowl organizers want a lot of leeway to put together the best possible matchup. Note: Start times listed are ET. Matchup: Semifinal game this season. Note: The kickoff time is correct, which means this one starts at 10 a.m. in New Orleans. That should cut down on the night-before-the-game partying (then again, maybe not). Note: This used to be known simply as the Las Vegas Bowl (Royal Purple makes lubricants for automotive, industrial and marine use). And the kickoff will be at 10:30 a.m. local time, which -- with the game being in Vegas -- should have zero effect on the night-before-the-game partying. Note: This is one of four new bowls this season. Given the central time zone location, you sort of wonder why this isn't a day game and the Vegas bowl at night. If this were indeed the matchup, it would be a good one, matching the projected winners in the MAC and Sun Belt. Note: This is one of the new bowls. The game isn't on Miami Beach; it actually will be played at Marlins Park, near downtown Miami. And why BYU wants to play in a bowl in Florida ... ? One thing to consider about this one: BYU plays AAC members Houston and UCF during the regular season, and you wouldn't think organizers would want a rematch. Note: This is another one of the four new bowls this season. It's played at FAU's on-campus stadium. Hey, there are far worse places to be than in south Florida around Christmas time. Note: This is the other new bowl. Christmas Eve in the Bahamas? That should be appealing to a few folks. But remember that traveling to the Bahamas requires a passport. Note: This is played in Cotton Bowl stadium (the stadium that plays host to the annual Oklahoma-Texas game) and had been on New Year's Day. Note: This had been known as the Little Caesars Pizza Bowl. We're not sure which name is worse. Take a look at Nike's latest updates to college football uniforms for the 2014 season. Note: This had been known as the Beef 'O' Brady's Bowl. Note: Projection is the SEC won't be able to fill its slot. The bowl has a secondary agreement with the AAC; hence, the pick of Tulane. Note: The Big Ten's push to the East Coast results in a slot in this game, which is played at Yankee Stadium. Take a look at the top 10 players from Penn State to play in the NFL. Note: That Penn State is listed here means we think the school's postseason ban will be lifted by the NCAA. This bowl had been played at AT&T Park, home of the San Francisco Giants, but is moving to the San Francisco 49ers' new stadium. Matchup: This is part of the "playoff" bowl group. The Peach will play host to a national semifinal in the 2016 season. Matchup: This is part of the "playoff" bowl group. The Orange will play host to a national semifinal in the 2015 season. Check out the top 10 players from Florida to play in the NFL. Note: The projection is that Army won't be eligible. That is an extreme long shot to begin with, and because the Big 12 has a secondary tie-in, Oklahoma State is the pick. Note: This had been known as the Gator Bowl since 1946. Note: This had been known as the Buffalo Wild Wings Bowl and is played on Arizona State's campus. Note: This had been known as the BBVA Compass Bank Bowl. Projection is that the SEC won't be able to fill its slot. Note: If South Alabama does indeed get a bid, it will be playing in its home stadium. The stadium also plays host to the Senior Bowl.